We’ve been excited about Demiforce’s unique gravity-based tile puzzler Trism [App Store] since we first saw it back in April, and with the arrival of the iTunes App Store, it’s finally here. 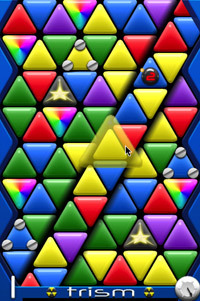 Trism presents the player with a playifeld populated by colorful, triangular tiles or “trisms." The rows of trisms can be slid in six different directions (thanks to their triangluar shape) in order to achieve a match of three or more like-colored pieces. When a match is made, the like trisms disappear and surrounding trisms fall in to fill their place in the direction of gravity. As the YouTube video demonstrates, a big part of the gameplay strategy involves the player repeatedly orienting the iPhone to best advantage. I have personally never been a huge “tile game" fan. Generally speaking, they fail to hold my interest for long. In viewing early demonstration videos, I was quite impressed to see the degree to which the game takes advantage of–or rather is designed explicity for–the iPhone’s touchscreen and accelerometer controls. It could be played on no other platform, really. Now that I have Trism on my iPhone, I am additionally impressed with the overall polish and clean graphics of the title. And gameplay? While I thought it likely that after a few minutes of toying about with its unique features I’d relegate it to the pile of tile games I’d never revisit, Trism surprised me. There’s something about the complexity of the game’s movement options along with the added dimension of being able to choose the fall-in direction that makes Demiforce’s puzzler seem much more “active" and engaging game than other tile games I’ve known. I like Trism and feel that at $4.99 it’s one of the better buys currently available on the iTunes App Store.